The community of Claremorris and further afield came together to pay their respects to Martin O’Brien, who died after a short illness bravely borne on Thursday 28 March. Businessman, family man and community leader, Martin’s life epitomised all that is good about the town of Claremorris, which was built and progressed on strong community spirit. Martin inherited the garage business fromhis late father Paddy, which was established in 1956. Four years later, O’Brien’s were appointed Fiat Dealers and soon became known as ‘The Home for the Italian brand in the West of Ireland’. In 1981, Martin joined Paddy in thebusiness after spending some time at DIT, Bolton St, Dublin and together the business thrived through building up a valued reputation in the sales and service of cars and light commercials with high levels of professionalism at all times. As the business continued to prosper, a new dealership branch was opened in Ballina, run by Martin’s brother Pat. A few years later, the original premises in D’Alton St was replaced with a state-of-the-art Sales Showroom & Service Centre. The appointment as Kia Motors Dealer soon followed. Although busy within his business, Martinselflessly volunteered his time to the betterment of the local community and its environs through his dedication and commitment to the Claremorris Swimming Club, Town Hall and Race Course Committees, to name a few. His direct involvement with the development of the new Leisure Centre at the site of the old Swimming Pool, (the first 25m pool in the County at the time), is a lasting legacy to his time and effort on the project. 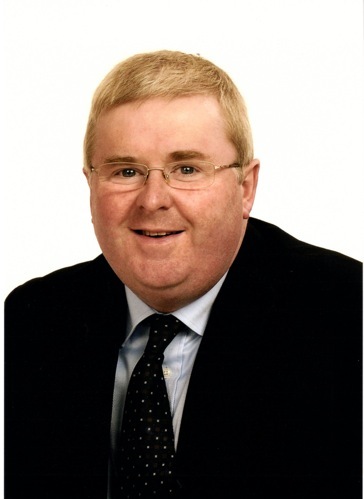 As a past President of the Claremorris Chamber of Commerce, Martin followed the footsteps of his father Paddy, and carried out the role with high esteem. Positions held for many years on the Town Hall and Race Course Committees were noted for his energy, enthusiasm and expertise. Relatives, friends and colleagues in the business community travelled from all over Ireland and some from abroad to sympathise with his wife Cathy and their three daughters Sarah, Kate and Lisa, brother Pat and sisters Mary and Lily and extended family. Martin will be deeply missed by his family and all who knew him. He was a wonderful raconteur and enlightened everyone with this quick wit and sense of humour. From an early age he was able to rhyme off the registration numbers of every customers car his father sold, such was his brilliant mind. His passion for Fiat and the motor industry never waned. Martin had given so much to his community and this was acknowledged by the extremely large number of people that attended his funeral over Easter weekend. With Martin’s passing at 50 years of age, Claremorris has lost one of the town’s finest gentlemen and community leaders in the prime of his life. May he Rest in Peace.